Designed to appeal to compact camera upgraders who instinctively want a DSLR, or at least something that looks like one, the Sony A3000 is an intriguing mix of mirrorless technology and DSLR styling that almost hits the mark. While the image quality is excellent for such a cheap camera, the handling, operation and overall build aren't quite up to scratch, with the LCD screen and electronic viewfinder in particular proving to be of low-quality. Still, we can't think of many other £370 / $400 cameras that offer interchangeable lenses, a built-in flash and hotshoe, 60/50i/25p video recording with stereo sound, and that all important DSLR look and feel, so if you can literally overlook the LCD and EVF quality, the Sony A3000 could turn out to be one of the bargains of the year. 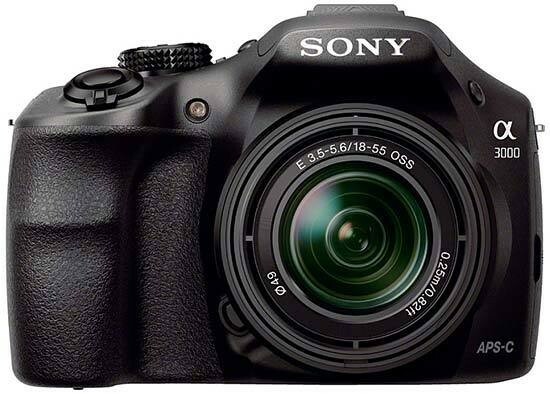 Rather than using the 16 megapixel sensor found in most of Sony's NEX cameras, the A3000 employs the SLT-A58's 20.1 megapixel sensor. Noise doesn't rear its ugly head until ISO 3200 for JPEGs, although the A3000 does apply some pretty aggressive noise reduction to keep the files clean, resulting in some loss of finer detail. The myriad range of creative effects on offer such as HDR, Dynamic Range Optimisation, creative styles, the innovative sweep panorama mode and in-camera Picture Effects help to get the most out of the A3000, especially if you like to experiment away from a computer. While the excellent image quality and keen price are definite plus points, the Sony A3000 lags behind when it comes to handling and performance, especially when compared against the DSLR rivals that it's trying to emulate. It's not especially speedy to start-up, and shot-to-shot times and auto-focusing speed, while respectable enough, aren't anything to write home about, and neither is the lackluster continuous shooting speed. We wouldn't call it slow, but you'll be disppointed if you're expecting DSLR-like responsiveness. And while the A3000 mimics the design and handling of an SLR, it's not that successful, with the lack of any control dials other than the rear wheel and the inability to quickly switch between the EVF and the LCD screen in particular revealing it to be something of a wolf in sheep's clothing. Still, there's no getting away from that price-tag, which will almost certainly decrease even further, making the Sony A3000 an attractive proposition despite the shortcomings that we've identified. While certainly not perfect, this DSLR doppleganger is an intriguing entry into the market that may just prove to be a hit for Sony.